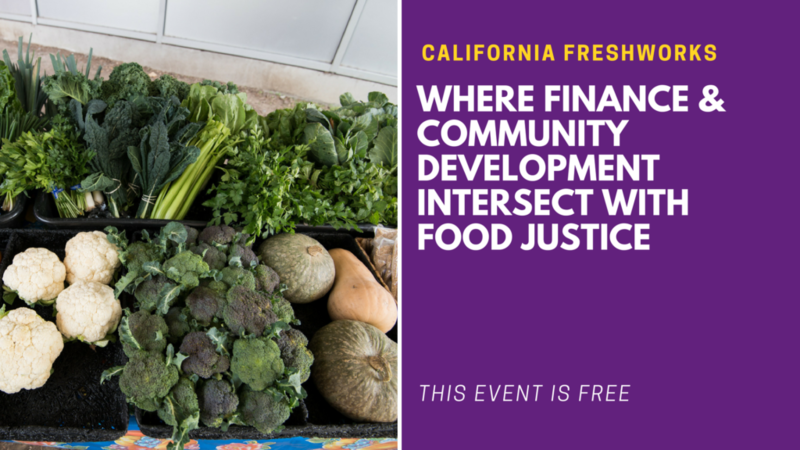 Join us in Fresno for a panel conversation to learn more about California FreshWorks and the way in which the program pairs financing with tools and services that help enterprises overcome barriers to financing and build their capacity to sustain a successful business. Examples include credit enhancements that improve the risk profile of a small businesses and free of cost technical assistance that builds business capacity and is responsive to the unique needs of each project and enterprise. Despite being nestled within the country’s most lucrative agricultural sector, California’s San Joaquin Valley experience high rates of poverty and low access to fresh food. We will highlight two organizations working to increase food access in the area: Cultiva La Salud and Self-Help Enterprises. Cultiva creates health equity throughout the San Joaquin Valley by fostering changes in communities that support healthy eating and active living. One of the few organizations in the country utilizing policy and environmental change, the Cultiva supports communities in gaining access to healthy food, beverages, and safe place to be physically active. In 2015, with FreshWorks’ support, Cultiva was able to fund vendor and kitchen trainings that allowed the organization to begin selling fresh-cut and whole produce throughout Southeast Fresno’s low-income communities. Visalia-based Self-Help Enterprises is a community development organization that works with low-income communities to build and sustain healthy homes and communities. In 2017, the Northern California Community Loan Fund, a member of the California FreshWorks lending network, provided Self-Help with a $75,000 forgivable predevelopment loan to fund costs related to design and permitting for a healthy food retail site on a vacant six-acre parcel of land in Goshen. This parcel will be part of the planned Goshen Village East Economic Development Project, which will add more than 130 affordable single-family homes and 240 rental units.